Why do boats float higher in salt water?
. . . and many more. 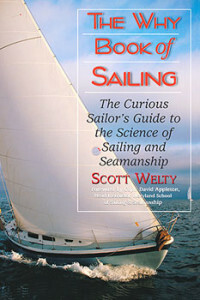 The Why Book of Sailing takes the helm to look at everything from vectors to leverage, the physics of floating and the science of navigation, the laws of electricity, optics, waves and more, in a book that will intrigue and delight every sailor. Scott Welty is a recently retired teacher of physics and now full-time cruiser aboard his 30-foot sailboat Enee Marie. A lifelong sailor, he writes for Sailing, Ocean Navigator and other publications.